2017 arrived bringing with it the political uncertainty from 2016. With the incoming US President's PR machine in full flow we are drowning in a deluge of unbelievable and extraordinary headlines. But for business, in reality there is no more clarity as to what exactly Brexit means for pharma plus the threat that the new US President will bring pressure to bear on US drug prices and the possible revocation of Obamacare in part, if not in full. In addition, early press coverage suggests that there may be an introduction of a bidding process to bring down the cost of drugs. So, with the recent Chinese New Year, the ancient curse springs to mind, may you live in interesting times! However there seems to be no deterrent to the deal makers, January was a bumper month with 25 deals coming in with headline values greater than $100m and no fewer than nine with headline value deals over a billion dollars. The change in the US political regime may bring an opportunity for some tax reforms but this will, if it comes, be too late for J&J which heads the January Deal Watch table spending its overseas dollars on the acquisition of Actelion for an all cash deal of $30bn (30 times price to estimated 2018 earnings). Pipping Sanofi to the post, the acquisition brings a high margin rare disease portfolio at the cost of $280 per share representing a 23% premium. The acquisition excludes the R&D portfolio which Actelion had spun out into a new standalone company. J&J will hold an initial 16% stake in this new business with rights to an additional 16% plus an option on ACT-132577, which is being developed for resistant hypertension (in phase II development). In Scotland, the first foot to cross a threshold after midnight will predict the next year's fortune. New Year First Footers bear traditional gifts such as a loaf for the kitchen, drink for the head of the family and coal to light the fire. Interestingly 2016 had opened with Shire's announcement that the Baxalta acquisition was going ahead resulting in one of the year's biggest headlines with its final value of £32bn. And, besides the $30bn Actelion acquisition, 2017 has had a great start with Takeda making good on last year's promise to spend some of its £15bn war chest with the acquisition of Ariad Pharmaceuticals. With an enterprise value of $5.2bn this acquisition brings access to Iclusig (ponatinib), approved for chronic myeloid leukaemia (CML) and acute lymphoblastic leukaemia (ALL), as well as brigatinib in phase II for lung cancer. Iclusig sales are forecast to reach between $170m and $180m. Takeda is paying $24 per share in cash, a 75% share price premium. The deal is expected to close by the end of February. It proved to be a very busy month for Takeda with the company paying $35m to PvP Biologics for KumaMax for coeliac disease which is in preclinical development. The deal terms include an option attached to buy the company, further terms were not disclosed. Using a similar structure, Takeda also announced a collaboration with possible future acquisition of Maverick which focuses on next-generation T-cell cancer research. With a headline value of $125m this includes an upfront, option, equity and R&D funding. But it was not all inward traffic with the company announcing a global collaboration with Ovid to jointly develop and commercialise Takeda's selective CH24H inhibitor TAK-935 for the treatment of rare paediatric epilepsies. Under the agreement there is an equal share of costs and profits. What goes around, comes aroundThe appetite for immuno-oncology (IO) has survived well into 2017 with Servier closing the biggest IO headline deal in January with Pieris for $1.7bn for ex US rights to several bispecific checkpoint inhibitors. The lead is PS-332 which is in preclinical development with up to seven additional programmes being able to be added in at a later date. 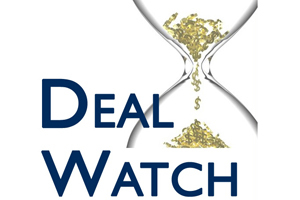 Also, hot off the block was Amgen with the purchase of Immatics' next-generation, T-cell engaging bispecific immunotherapies. Paying $30m upfront, each programme has a potential value of $500m reaching a headline value of more than $1bn in total. This builds on Amgen's agreement with Xencor for its XmAb bispecific technology platform signed up in 2015. If the old year goes out like a lion, the New Year will come in like a lambThis month saw BMS/Ono reach an agreement with Merck & Co in their patent dispute over Keytruda (pembrolizumab) therefore avoiding a court appearance scheduled for later in the year. With an immediate initial payment of $625m, the settlement includes a royalty of 6.5% (due from Jan 1 2017 to Dec 31 2023) and a lower royalty of 2.5% (from Jan 1, 2024 to Dec 31, 2026). In a similar vein, Forward Pharma and Biogen also reached a settlement agreement over the Tecfidera patent dispute by closing an irrevocable licence valued at $1.25bn. Begin the New Year square with every manValeant has recently been focused on paying off some of its $30bn debt, so it was not surprising to see the company announce some divestments bringing in around $2.1bn in cash. With sales of $168m, L'Oréal acquired three skin care brands CeraVe, AcneFree and AMBI for $1.3bn cash. Bringing in an additional $819.9m in cash, Valeant also sold its equity interest in Dendreon (manufacturer of Provenge, a personalised immunotherapy) to the Sanpower Group. Dendreon had only been acquired in February 2015 from bankruptcy for $495m (reported in DW issue no 56). Information, information, informationAlthough not featuring in January's Deal Watch table there is a huge amount of activity in the digital/ telemedicine space which is interesting to note. One common feature is that the financial terms are rarely disclosed but we do expect to see more news flow as companies seek partnerships as the way forward to maintain competitive advantage in key therapeutic areas. Clearly the major companies such as GSK and Sanofi are able to form joint ventures with companies such as Verily to access digital technologies but smaller and mid cap businesses are keeping up with the trend. As you sow, so shall you reapThe use of options is remaining widespread as noted in the Novartis deal with Ionis and Akcea. Paying up to $1.6bn the agreement covers an exclusive option to license two investigational cardiovascular products expected to reduce cardiovascular risk in patients with elevated lipoproteins. The deal includes an upfront payment of $75m plus a $100m equity investment with agreement to invest a further $50m within 18 months, as well as up to $1.4bn in milestones. So, all in all a buoyant start to the deal making in 2017, it should prove to be an interesting year.